Tokens separate data from presentation by acting as placeholders that each represent a location in a template that the templating engine uses to embed the correct object property data at render time. Essentially, each token is a way to expose a property of a data object to the UI for manipulation within a template, with the understanding that the underlying information will change based on the context of the action occurring. Why/When Should I Use Tokens? If you are creating a new Application or Content, or adding additional data/properties to an existing Content or Application, you should consider adding tokens so that your data can be used in templates. 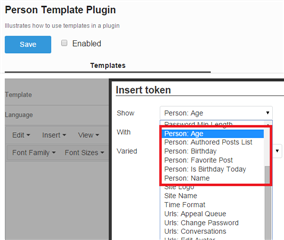 An ITokenRegistrar plugin serves to identify data snippets/properties that can be used in the UI where templates are used. We need to set up a few things before we actually get to the implementation of ITokenRegistrar. First is a sample data class that we can create tokens for. This would correspond to the custom content or other objects that you have created to integrate with Telligent Community. Keep in mind that this is an illustrative sample and is not a guide on building data classes. Another key component is to implement the token class interfaces. We define the interfaces as part of our Extensibility toolset, but leave the implementation to the third party developer to allow them flexibility in how they approach components like translation. For our example, we will use a simplified implementation of ITokenizedTemplatePrimitiveToken that does not include translation. A full implementation of each token type that includes translation is included at the end of this article. With the token defined, we can now register instances of the token that will appear in the template editor when the corresponding context is specified. Registering tokens is as simple as a series of calls to Register(). In the declaration, you define a Func<TemplateContext, object>() that is responsible for extracting the data it needs to provide from the context provided. // Naming convention allows consistency in display in the token drop-down menu. A note about ContentTypeId vs DataTypeId: each token category needs a unique id to represent when to include those tokens in the token selection list in the template editor. Because some of these tokens are for Content Types such as blog posts, the ContentTypeId was reused in these cases. For tokens that are not for a Content Type - for instance, likes or mentions - a new Id was created and referred to as a DataTypeId. ITokenizedTemplatePrimitiveToken is just one type of token, the simplest type that simply presents a piece of data. ITokenizedTemplateLinkUrlToken and ITokenizedTemplateImageUrlToken are variations of the basic token, automatically rendering <a> or <img> tags (respectively) around the data provided. Two additional token types, ITokenizedTemplateEnumerableToken and ITokenizedTemplateDataTypeContainerToken, are used primarily for exposing object properties from your class that in turn have their own properties exposed by tokens. These implementations require some manipulation of TemplateContexts when resolving, but allow access to all possible properties for all possible related objects within the same template. ITokenizedTemplateDataTypeContainerToken requires adding the object property to the context, identified by the unique id for that object's tokens. ITokenizedTemplateEnumerableToken is used for list properties and requires you to create a list of sub-contexts, each with one of the objects from the list populated. 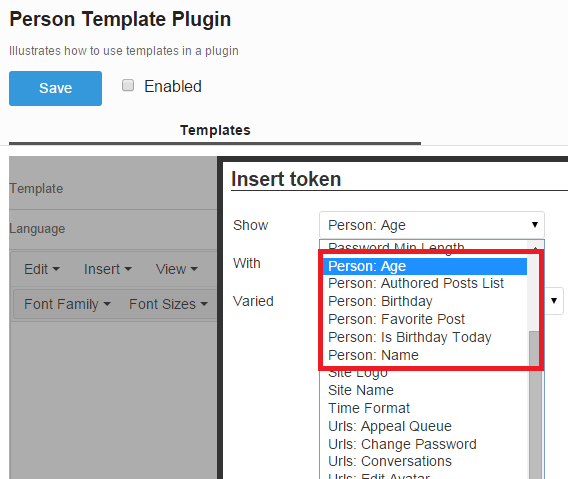 You can set up your plugins to have templating available and include your tokens, built-in tokens, or both. For more information, refer to the article on Template-based Email.